Yesterday I showed you some of the Promenade at Downey marketing slogans that give a nod to our aerospace history. Today's picture shows some of the more permanent acknowledgments of that history. First is the address. The new street that has been created to access the Promenade is called Apollo Way, after the Apollo space program that built 17 command and service modules here. Then, these large murals cover several of the buildings that have been completed so far. 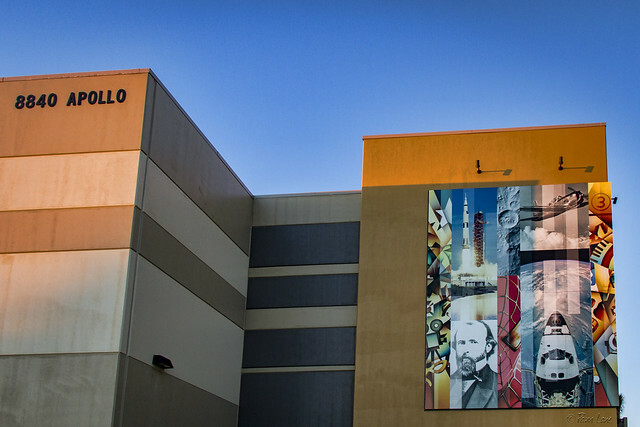 This mural shows not only our aerospace history, but the borders on each side acknowledge the Downey Studios that used to exist here. Not to mention the picture. Isn't that John Downey?